Fun things to do on New Years Eve at Home, this is what people think, when they wish to welcome the new year with only near ones. The year is coming to an end and everyone around is getting geared up to welcome the New Year 2019. Countdown for ending of 2018 has begun. Life is all regular and normal during the year, so why not make the best out of the New Year Eve and make the event filled with fun. 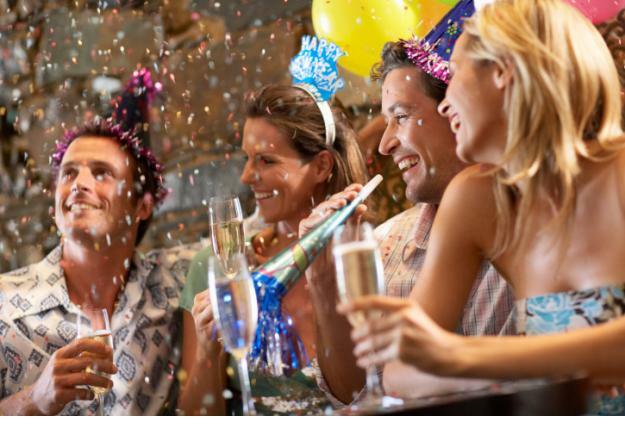 Moving out on the day of New Year’s Eve is like getting involved in all the crowd, screaming and shouting, but if you wish to have the same fun at home with your friends and family, then here is the list of the few fun things to do on New Year’s Eve at Home. Some best party ideas to celebrate New Year’s Eve at home are waiting for you. The most necessary thing for any celebration is, arranging for New Years Eve Party food. You can have your friends, right from the morning or afternoon at home and cook some interesting meal together. This thing is real fun, if friends are happy go lucky. Ordering food from a restaurant is also a good option, but do it prior, so that you don’t have to make settlement. Do not forget to add some non alcoholic drinks for children and a good wine or champagne for adults. Drinks are the one, who actually adds to the party mood. Make a list of fun games for the New Year Eve Party. Some indoor games ideas to play on New Year’s Eve can be as listed below. New Year Resolution ideas for couples. Click on the link to know more. This game can be really funny, if you can collect some good food items for tasting. It can be either food or drink. For adults, you can keep only wine tasting game, in which identifying the brand can be very much be a fun. You can also prepare a score card for deciding on a winner. This can be the most exciting new years eve party game at home for families. You can plan for a pointer board or passing the parcel, the fun here can be the craziest punishments that you and your friends can decide on. Just keep the taste of all into consideration. This can turn up to the most exciting New Years Eve Party games at home with families. Making a group of two and going for a treasure hunt with clues hidden in the corners can make the fun double out. It can be played with kids or adults, but fun is guaranteed. You can add fun with the words in the clue cards. All you have to do is informing all friends to be dressed in the most funny manner or pose in the funniest style. It can be either in a couple or single and the funniest will win the New Years Eve Party game. You all can sit and relax and make everyone open out on funny things that happened to them during the year. It can be either personal or in a group, but something which still makes them laugh. Happy New Year Greetings Messages 2019. Click on the link to get the best New Year Messages of 2019. Why not to have a fun time with a black and white funny movie. Even a silent movie can create a lot of humor. Go back to the childhood days and have fun watching favorite cartoon movies of your childhood with your children. Be prepared to welcome the New Year 2019 with sparkling lights, champagne bottle, balloon burst and shout out loud Happy New Year. If you have an open plot or open area, you can arrange for fire works sharp at 00:00 hrs to commence the year 2019. The best part of the celebration of New Year’s Eve, is to be with the people, you love. So don’t forget to hug your dear one and kiss to celebrate the time in each others company. Fun Things To Do On New Year’s Eve At Home with friends and family is fruitful only when cheers and happiness are all around. Fun things on the New Year’s Eve is fruitful, if you have best of pals and the one, you love is with you. Enjoy the New Year’s Eve with great zeal and make it a life time memorable moment. Happy New Year 2019. Countdown has begun.